The Mukuru Special Planning Area (SPA) process is a rare, precedent-setting opportunity for participatory upgrading partnerships at scale. It demonstrates a significant concession by local government that conventional planning processes cannot adequately address slums’ complex challenges. It recognizes the critical input needed from communities in improving their settlements. And it creates space to explore new, innovative, inclusive upgrading solutions over two years. Mukuru slum belt (Mukuru kwa Reuben, Mukuru kwa Njenga and Viwandani areas) is the site of ongoing innovative, large-scale and collaborative community planning processes that are jointly led by Nairobi County government and community residents. The SPA also involves 40+ organizations from civil society, academia and the private sector, and mobilization is coordinated by the Muungano Alliance (comprised of Muungano wa Wanavijiji—the Kenyan federation of slum dwellers—Akiba Mashinani Trust and SDI Kenya). The Mukuru slums cover almost 650 acres and are home to at least 300,000 people. The challenges facing Mukuru are among the most severe in the city: the Muungano Alliance’s profiling and enumeration work, with research partners at Kenyan and international universities, has revealed the highest population densities in Nairobi city. There is a high poverty penalty exacted on residents, whose access to basic services is controlled by cartels. The area faces severe flooding, and because of its location in an industrial area has elevated levels of air, water and soil pollution. Virtually all of Mukuru’s land is privately owned, by around 230 landowners. And 94 per cent of residents are tenants, meaning there are a many layers of complexity in the Mukuru housing and land economy, and many actors competing for the benefits of regularization. an area which has “unique development and environmental potential while also raising significant urban design and environmental [social, economic, and physical] challenges”. At the heart of the SPA planning process is the participation of Mukuru’s residents. 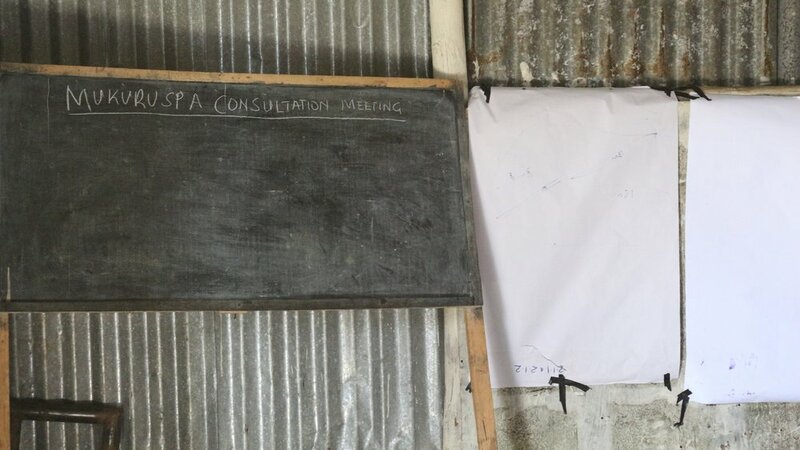 The Muungano Alliance has worked with the Mukuru community for over 10 years, and its SPA role is to mobilize the community, help organize the consultation process, and coordinate the 40+ organizations working together to draw up the integrated development plan. Muungano is intensively organizing Mukuru residents into women-led savings groups and neighbourhood associations, in order to (1) ensure robust community participation at every stage of the planning process and (2) to incorporate local enterprises into the upgrading and service delivery value chain. In the latter months of the SPA process, the Muungano Alliance and other organizations involved will also work with the County government to further convene and brief local MCAs, Ward Adminstrators, Area Chiefs and thematic Assembly committees, to gather their inputs into the process and to share the issues coming out of the consultations, plus challenges, goals and next steps. Nairobi City County has convened over 40 organizations, in 8 thematic consortiums (see graphic below), working together with the County to come up with an ‘integrated development plan’ for the Mukuru slum area. 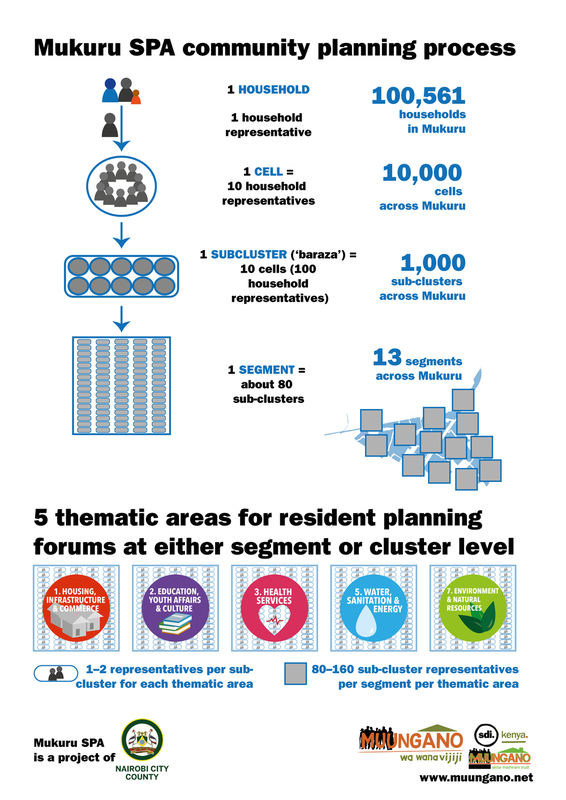 The aim of this plan is to find a city scale, planning response to exclusion that will transform Mukuru—where over 100,000 slum homes, businesses and institutions are located—into a healthy, functional city neighbourhood, and in this way improve the lives of the women, men, girls and boys who work and live there. Each thematic consortium is developing a range of solutions that encompass (1) the community’s vision and (2) the financing, legal and spatial dimensions of developing Mukuru. How did we get to a Mukuru special planning area? The 2017 SPA declaration in Mukuru was the result of years of action-based research and interactions between Nairobi county government and many organizations working with the Mukuru community—including the Muungano Alliance, Strathmore University, University of California Berkeley and the University of Nairobi, with support from IDRC. In addition, Mukuru is the product of historic forces and factors that have contributed to what this informal settlement is today, and which have limited the state’s response to Mukuru’s problems. In the 1980s and 1990s, private land parcels in Mukuru are issued by the Kenyan government for developing light industry and for establishing factories that are supposed to create jobs. The grants are 99-year leaseholds with special conditions: grantees must develop the land within two years; cannot sell the land before it has been developed; and must not use the land as collateral before development—except for developing the land. The special conditions also give the state the power to rescind the land parcel grants if the grantees fail to develop the land as agreed. Kenyan city growth is rapid but inequitable—after independence, the basis for urban spatial segregation just shifts from race (under colonial rule) to wealth and class. Autocratic leadership, poor governance by the elite, and only intermittent urban policy and planning structures further entrench exclusion of the poor. Supplies of affordable housing and services lag far behind demand, and migrants and low-income Nairobians increasingly resort to finding, constructing or renting in informal settlements. By 1993, half of Nairobi’s then 1.8 million residents live in slums, in improvised structures with little or no tenure security or basic services. Private landlordism is widespread. Many of the squatters who live in Mukuru arrived there seeking work in the surrounding industrial areas, including the family of Evans ‘Papa’ Omondi, who was born and raised in Mukuru kwa Reuben. In 1997, Papa, now 67, was part of the first Muungano slum dweller exchange to South Africa. Mukuru expands and densifies dramatically. Greater proximity to the river, railway reserve, a petroleum pipeline and electric power reserves all increasingly expose residents to natural calamities and man made disasters. In one tragedy, in September 2011 in Sinai A village, an oil pipeline fire kills over 90 people. Rising land values and continued lack of tenure security mean evictions are a constant threat. In 2002, settlements cover about 50 % of the SPA area; the Ngong river riparian zone is largely undeveloped. In 2006, settlements cover about 75 % of the SPA area; the Ngong river riparian zone still largely undeveloped. In 2010, settlements cover about 85 % of the SPA area; the Ngong river riparian has a moderate buffer zone but this is being rapidly built on. In 2016, settlements cover about 95 % of the SPA area; and the Ngong river riparian zone is completely developed. Move the slider over the image to see how things have changed between 2003 and 2016 in one area of Mukuru. The State may regulate the use of any land, or any interest in or right over any land in the interest of defense, public safety, public order, public morality, public health or land use. The new constitution also promises to strengthen local accountability and public service delivery at local levels—by mandating new public participation channels for communities to engage county governments on development and civic issues. Evictions crisis and protest. The Muungano Alliance undertakes massive mobilisation throughout Mukuru to resist a wave of forced evictions and demolitions in the slum. 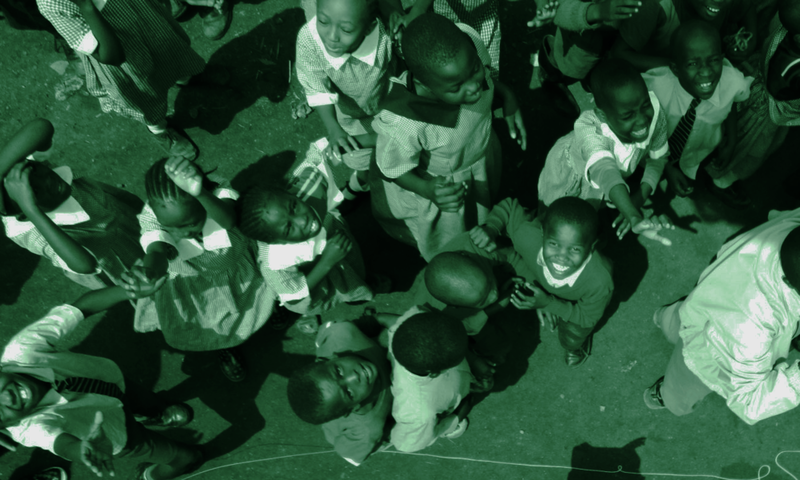 In one early instance, in 2011, the planned auction by Kenya’s Cooperative Bank of the land on which a local school—Maendeleo Learning Centre—stood, triggers mass resistance. The Mukuru community march to Nairobi city centre and their protest successfully stops the auction. This success triggers more people to bring more eviction notices to the Muungano office—which are always attached to a copy of a land title deed, and this helped the Alliance to initiate a process of identifying Mukuru’s land title holders. Patrick Njoroge, AMT officer, tells the story of the Maendeleo auction protest. This clip is part of an oral history project to tell the history of Muungano wa Wanavijiji's first 20 years (1996-2016) through the words of 50 slum dwellers, activists, professionals, and civil society partners who were there at different stages along Muungano's journey. Interviews were carried out by a Muungano team in 2016. 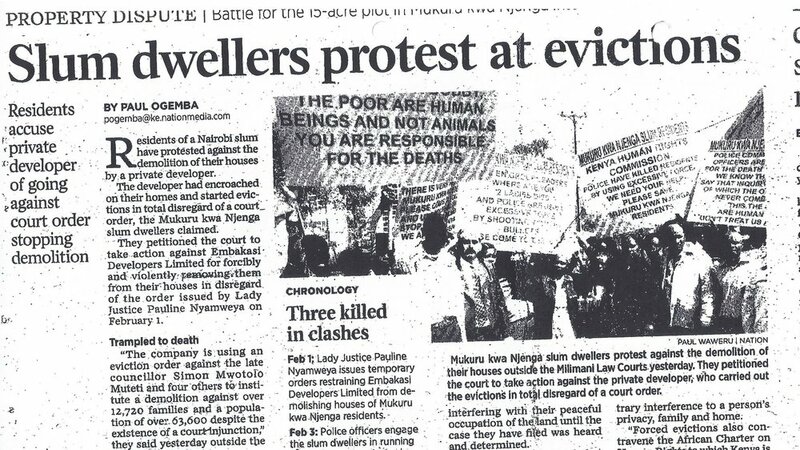 In 2012—helped by the 2011 work which started to identify Mukuru’s land title holders—the Alliance and Mukuru residents file a court case that results in an injunction to stop evictions in Mukuru. They sue over 20 title holders, including former president Moi. The Muungano Alliance’s 2012–2013 Jubilee campaign (no connection to the political party) includes religious organisations, the Mukuru community, court orders, theatre and arts—essentially bringing everyone together to stop the evictions. As Muungano works with the community to successfully resist the imminent eviction threats, the highly complex, layered context of private interests in Mukuru becomes ever more clearly apparent. The Kenyan Physical Planning Act (Cap 286) Section 23 makes provision for the declaration of an area with “unique development potential and problems” as a Special Planning Area. In effect, this Act provides the legal, institutional and procedural context for making physical development plans. The underlying intent behind this new provision for an SPA is therefore to provide more flexibility in plan-making processes, to better respond to development situations which are under difficult and/or unique circumstances—in other words, to allow the state to consider new, innovative and creative planning responses to uniquely complex, challenging contexts, like in many informal settlements. Smruti Jukur explains what makes the Mukuru Special Planning Area "special", the integrated planning process, and why the world is watching this precedent-setting project. 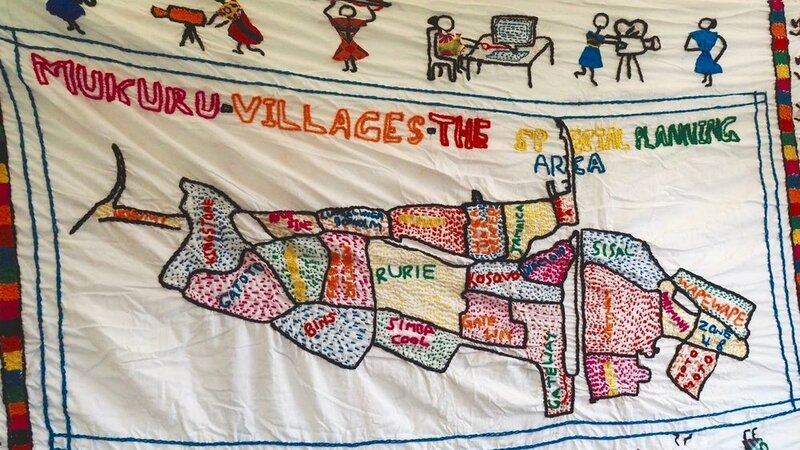 Smruti is an urban planner for SPARC, based in Mumbai, India—one of the 42 organizations providing technical support to the SPA planning process in Mukuru. Over 60 % of Nairobi’s population now lives in slums, occupying about 1.62 % of Nairobi’s land. Drawing on the strength of the community mobilisation and advocacy in 2010–12, Muungano’s 2013 women and sanitation campaign in Mukuru calls for change in the settlement by drawing attention to the appalling public health situation, in particular how women in Mukuru experience the lack of adequate sanitation services. In one protest action, Mukuru women barricade the entrance to the health ministry. Dorice Bosibori, who lives in Mukuru, describes the intentions behind the 2013 women and sanitation campaign. This clip is part of a digital archive telling the history of Muungano's first 20 years through the words, memories and stories of slum dwellers, activists, professionals, and civil society partners who were there at different stages along Muungano's journey. Interviews were carried out by a Muungano team in 2016. The Nairobi City County Public Participation Act provides the framework for Kenyan county governments’ engagement with the public. The Nairobi City County Regularization of Development Act seeks to bring unauthorized developments under the umbrella of a planning framework; it applies to both private and government-owned land. The Nairobi City County Community and Neighborhood Associations and Engagement Act, 2016, will go on to help community groups in Mukuru to organize within a framework approved by the County government. The “poverty penalty” faced by Mukuru’s over 100,000 households, who pay 3 to 4 times more for the low-quality available services than do residents of nearby middle-class areas for their far better provision. Compared to formal water customers, Mukuru residents pay 173 % more for water that is reticulated using spaghetti pipes running through filthy trenches and along dirty, narrow pathways, and 45 % more for unreliable electricity supplied using unsafe, informal connections. The complex, highly commercialized web of informal power and governance in Mukuru, especially related to land, housing and service provision, including cartels controlling water and electricity provision, and exposing registered shell companies holding land titles for speculation and as bank loan collateral. David Mwangi, SPA community mobilizer, from Lunga Lunga village, Viwandani, Mukuru, describes some of the effects of the poverty penalty on Mukuru residents. In this film, Mwangi reports back on a 2018 consultation held Viwandani by the Mukuru SPA’s Water, Sanitation and Energy consortium. SPA is declared. In 2017, Nairobi City County government declares Mukuru a “special planning area”, effectively freezing development for two years until an integrated development plan is produced by a coalition of actors working together with the Mukuru community to identify challenges and solutions. After some months of community data collection, situational analyses and training community mobilizers, the community-led planning process begins in mid 2018. SPA stands for Special Planning Area. According to the Physical Planning Act 2012, a County government can designate an area a Special Planning Area (SPA) if it is has “unique development and environmental potential while also raising significant urban design and environmental challenges”. When an SPA is declared, the County government starts a 2 year planning process. The plan is supposed to realise the development potential of the SPA area through investing in the design of the area. For this to happen, the County stops new developments in the area, except for projects that improve access to essential services like water, electricity and sewerage. Through Kenya Gazette Notice 7654 the Nairobi City County Government declared Mukuru to be a SPA on the 11th of August 2017. The SPA has been declared across the 30 villages and 13 zones that together make up the larger Mukuru Kwa Njenga area, Mukuru kwa Reuben area, and Mukuru Viwandani. The planning process will take place between August 2017 and August 2019. Declaring Mukuru Kwa Njenga, Mukuru Kwa Ruben and Viwandani area as a SPA will allow the county government in consultation with the Mukuru community to come up with a Mukuru integrated development plan. Mukuru is 647 acres. Most of Mukuru sits on private land. There are 223 private plots. One key aim of the SPA is to find a way to make the land available for the development of the Mukuru communities. Mukuru is faced with many risks. Large infrastructure lines such as high voltage power lines, the railway, and oil pipeline pause risks. Mukuru also has high incidence of flooding, fire and diseases such as cholera. The plan is intended to address these risks. Mukuru is also home to more than 300,000 people. It is also has a very vibrant business sector, it has a lot of schools, religious and cultural centres and it has an economy of more than Ksh 7 billion. The SPA aims to improve this potential of Mukuru. The neighbourhood deserves the best. We want a Mukuru with better roads and drainage, and with proper waste management. We want a Mukuru safe from flooding, fires and natural disasters. We want a Mukuru with good schools, health facilities and spaces for businesses. We want a Mukuru free from evictions, a Mukuru where land conflicts are resolved and where our children and youths can develop their talents. What will the Mukuru integrated development plan have? The plan will show where roads and footpaths will be located. The roads and footpaths guide where water, electricity and sewer lines pass. The plan will show where residents can settle, away from risky and environmentally unsafe areas. It will create public spaces, and opportunities for the development of employment, cultural and social opportunities. The plan will set up the standards for construction that fit Mukuru and can accommodate the population of Mukuru. This will be an opportunity for communities wishing to improve their housing. The plan will provide ways of improving the environment, managing waste, improving access to good education and health. The plan will not design houses in Mukuru. After the plan, residents in each area will have the opportunity to plan housing developments that fit them as an individual neighbourhoods. The County will provide support to neighbourhoods to realise improvements to their neighbourhoods. To participate in the SPA you must be a community member of the Mukuru SPA declared area. Individual household addresses: The planning process divides the Mukuru SPA area into 13 segments* (ie neighbourhoods). Each segment/neighbourhood has approximately 8000 residents. The planning team will put an address number on the door of each household (room) in Mukuru. This number will tell you which neighbourhood you are in. 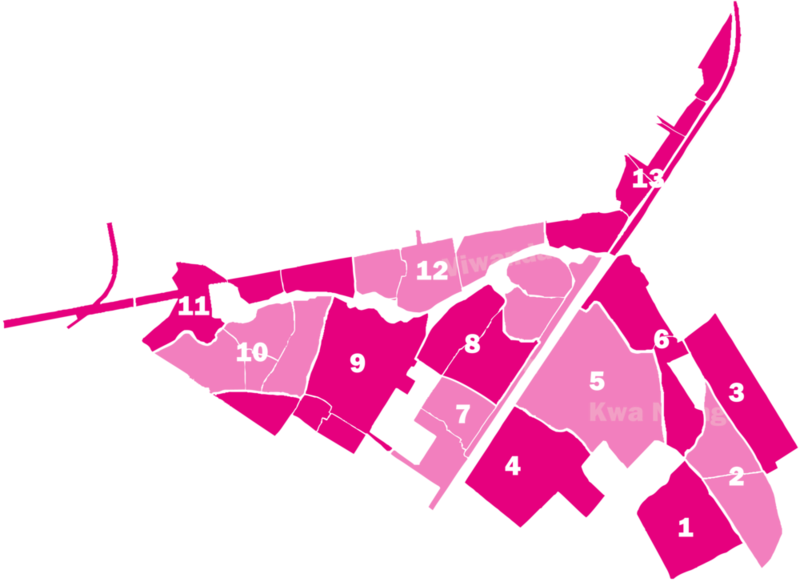 Cells of 10: Every numbered house will be approached to give household information. You will be asked to be part of a cell of ten houses. Frequently, information on the planning process will be passed on to you through a representative you choose in your cell. Barazas: You will also be invited to barazas of 100 households to discuss your views on the planning. Through the cells of ten, every household has an opportunity to participate in the barazas. Segments: Barazas are organized into segments: a segment is a geographical and demographic unit of representation and participation in the Mukuru Development Integrated Plan. A segment represents not less than 7000 and not more than 8000 families. As a result the entire SPA area has 13 segments. Through cells of 10 and barazas, the integrated development planning process has organized the entire Mukuru community into 13 segments. Planning consultations with the thematic consortiums will take place at the segment level. Sectoral/thematic planning areas: Mukuru Integrated development plan will be developed around the following 7 thematic areas, which are aligned to the County integrated development plan (CIDP): (1) Water, Sanitation and Energy, (2) Environment and Natural resources, (3) Land and Institutional arrangement, (4) Health Services, (5) Finance and economic development, (6) Housing, Infrastructure and Commerce, (7) Education, youth affairs and culture. Sectoral/thematic community consultation at the segment-level: The segments shall form groups along these 7 sectoral/thematic lines. Planning sessions at the segment or neighbourhood level shall be sectoral or issue based. Each baraza (100 families) will select 2 members (gender balance is a must) to represent them in planning consultation meetings and to report back. The planning process has set three periods for consultation. The Nairobi City County Government, and the 45 organisations partnering in the planning, will meet with the residents of Mukuru in these three periods. In each period, five meetings will be held in all of the 13 neighbourhoods that the SPA creates. (1. Housing, Commerce and Infrastructure, 2. Water, Sanitation and Energy, 3. Environment and Natural resources, 4. Education, youth affairs and culture, 5. Health Services). In your baraza you can choose 2 representatives for each of these meetings. In the 1st consultation period, the planning teams will present the information they have collected and listen to ideas for solutions. In addition, the Housing, Commerce and Infrastructure consortium will be consulting at the cluster level. In your Baraza you can choose 2 representatives for each of these meetings. In the 2nd consultation period, the planning teams will present draft plans and get feedback. 1 x 13 meetings on Health Services. In the 3rd consultation period, the planning team will present a draft final plan and get your feedback. In this period, one meeting on the integrated development plan will be held in each of the 13 neighbourhoods that the SPA creates. 1 x 13 meetings on the plan (which will integrate housing, commerce and infrastructure; water, sanitation and energy; environment and natural resources; education, youth affairs and culture; and health services. SPA ni nini? Nani ana uwezo wa kutoa matangazo? SPA inasimamia Special Planning Area kwa kimombo yaani Eneo Maalum ya Kupangilia maendeleo. Kulingana na Sheria ya Physical Planning Act 2012, Serikali ya Kaunti ina weza kutenga sehemu ya makazi kama eneo maalum ya mipango iwapo inakabiliwa na changamoto za kimazingira na kimaendeleo na kwa hivyo kutoa nafasi za kipekee za kupangilia mabadiliko. Mradi huu wa kupangilia mitaa yetu itawezesha Serikali ya Kaunti kushauriana na wakaaji ili kutoa suluhu za kubadilisha changamoto na shida zinazotukumba za kimaendeleo kama vile; mazingira, afya, elimu, uchumi, barabara nakadhalika. Mtaa wangu unahitaji mipango mizuri. Nahitaji Mukuru iliyo na barabara nzuri, mitaro ya maji taka na utaratibu wa kukusanya taka taka. Nataka Mukuru iliyo salama kutokana na mafuriko ya mvua, adhari za moto na janga za kimazingira. Nataka Mukuru itakayo toa nafasi za elimu kwa watoto, upanga kutaimarisha mazingira; kutaunga mkono mipango endelevu; kutatoa nafasi mpya za kazi kupitia ujenzi wa makao na miundo msingi pamoja na kuboresha hali ya maisha ya jamii maskini. Nahitaji kuwa mwana kijiji wa eneo lililo tengwa na Kaunti ya Nairobi kama eneo maalum la mipango ya maendeleo. Yaani, Mukuru Special Planning Area. Pia nahitaji kuungana na majirani wangu kwa mpango wa nyumba kumi-tujuane tujengane. Kupitia tujuane tujengane (nyumba kumi) tutajumulisha familia 100 ilikuunda baraza letu la Familia (Family Baraza)la mashauriano. Hapo katika baraza letu la familia 100 tutajadiliana kuhusu maswala yanayotukabili mtaani, tutatoa maoni yetu juu ya suluhu mwafaka yakutatua shida hizo na kisha kutuma wajumbe watakao tuwakilisha kwa vikao vya maswala ya mitaa. (Neighborhood Issue Based Forums). Kikao cha Majadiliano Mtaani (neighborhood Forum) kitajumulisha waakilishi wa familia karibu elfu Nane. Hawa watakuwa ni waakilishi wa baraza za familia vijijini. Kila baraza la familia 100 itawakilishwa na wajumbe wasio pungua wawili (Lazima Jinsia izingatiwe) kwa kila swala. Maswala 7 muhimu yatatumika kushirikisha maoni ya wakaaji kwa vikao vya Majadiliano Mtaani (Neighborhood Forum). Maswala 7 ni; (1) Maji, Usafi na Nguvu kawi, (2) Mazingira na rasilmani, (3) Ardhi, (4) Huduma za Afya, (5) Fedha na maendeleo ya uchumi, (6) nyumba, Miundo msingi na biashara, (7)Elimu, Maswala ya Vijana na Tamaduni.